OXFORD, Miss. – The national tour of “The Wizard of Oz” stops off at the University of Mississippi’s Gertrude C. Ford Center for the Performing Arts for one performance at 7:30 p.m. Sunday (Oct. 21). The musical, based on the most recent Broadway production, is a celebration of the 1939 film, and audiences will find all the characters and songs they love, with a few surprises. 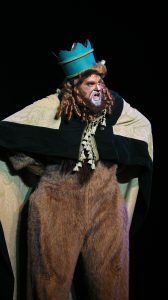 Nicholas Pearson, who performs the role of the Cowardly Lion in this production, is celebrating his one-year anniversary as a cast member. Even though he has been with this touring production since October 2017, Pearson said he continues to enjoy feeling the energy of each audience as the show travels across the country. Pearson said he hopes those who come to see the musical on Sunday, even if they have seen the film or stage production before, will leave the Ford Center with the show’s positive message. Tickets are $75 for orchestra/parterre and Tier 1 box-level seating, $69 for mezzanine and Tier 2 box-level seating, and $63 for balcony seating. A 10 percent discount is offered to Ole Miss faculty, staff and retirees. Student tickets are $35 for balcony seats only. Tickets can be purchased at the UM Box Office at the Ford Center or online at http://fordcenter.org/. Discounted and student tickets are available only at the UM Box Office with a valid Ole Miss ID. For more information on “The Wizard of Oz,” visit http://fordcenter.org/event/the-wizard-of-oz-national-tour/.